The six gold martlets (heraldic swallows) on a blue field have been associated with the county of Sussex for centuries. 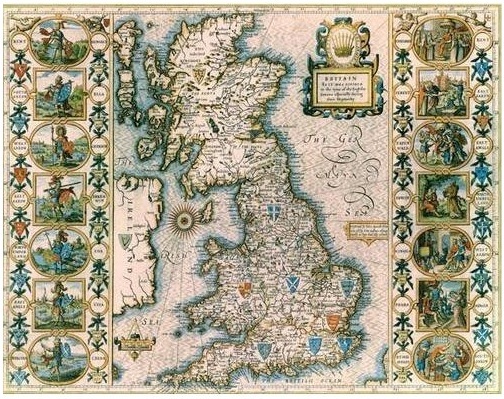 They featured in John Speed’s 1611 atlas on a map the depicting the Anglo-Saxon kingdoms, attesting to its venerable status. The emblem is used by a great number of associations based in or linked with Sussex. When the registry was first established the flags of Kent, Middlesex and Essex were all included on the basis of their historicity and the traditional flag of Sussex was duly registered on a similar “traditional” basis in 2011, following a campaign led by the Sussex Association, fronted by ABC members David and Brady Ells. 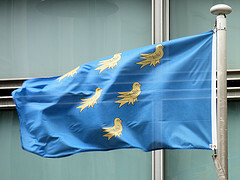 The registration was completed in time for the Sussex flag to fly outside the offices of the Department of Communities and Local Government, (DCLG) in 2011. For a full history and account of this flag see the magnificently well researched Sussex flag campaign’s website.